Not The Barnet Times: The Return Of The Beast? It is being predicted that David Cameron will give Ken Clarke a place in the shadow Cabinet in his forthcoming reshuffle. Some right wingers, including the redoubtable John Redwood, are reported to be against his appointment because of Clarke’s Europhile tendencies. However, most Tories acknowledge that with Peter Mandleson now effectively running the country, they need a big hitter on their team, and they don’t come much bigger than cuddly Ken! Conservatives opposed to Clarke must look at the wider picture. We need to get back into power before Labour totally bankrupts this country. 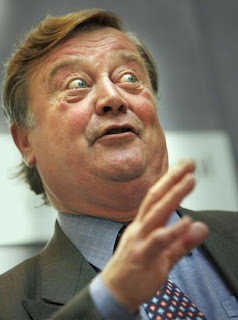 Ken Clarke appeals to voters of all political colours - and of none. People like him because he is a good bloke and talks their language. If anyone can put Labour’s Prince of Darkness into the shade, it’s Clarke. So the sooner he is brought back into the fray the better. Being in the shadow Cabinet does not mean that he will automatically become a Minister in the next Conservative government. Once victory is secured, a loyal lieutenant can always stab him in the back to get rid of him. I’m sure there must be someone in the Tory ranks capable of such a Machiavellian deed. If Ken Clark had been prepared to pretend to have ditched his Europhile tendencies, he'd have become Tory leader long ago. When he left the treasury the books were pretty well balanced & it is quite universally agreed he did a good job (even by Labourites). Gordon Brown stuck to his spending plans for 3 years so even he agreed that Clark was on the right track (I heard a quip that Clark was Labour's best ever chancellor). Mind you, having seen what the Tories have done to the finances of Barnet Council, I guess that balancing the books isn't what they want to do these days? If I was Cameron I'd have him back like a shot and make him chancellor. You need people who will tell you things you don't like and Clark will certainly do that. He's leader so he doesn't have to listen though. You seriously want Ken Clarke back Dave? All your cosy chats with Rog T have clearly turned you into a swivell eyed Trot! You are implying that Ken Clarke is a bit of a lefty, but it was Clarke as Health Secretary who introduced the concept of an internal market in the NHS - at the time very much a right wing idea. As Chancellor, he reduced income tax, reduced government borrowing and halved the budget deficit. He was a proper fiscal Conservative, not a tax and spend socialist. Polls consistently show that he is very popular amongst party members, including those on the right. It was only his views on Europe that scuppered his leadership chances. The next election will be fought on completely different battle lines. The Labour Government is bringing this country to its knees. It is quite clear that George Osborne is simply not up to the task of holding Labour to account, whereas Clarke could make mincemeat of Darling and Mandleson without even breaking into a sweat. If Clarke is brought back for no other purpose than to help the Conservatives get back into office, I see nothing wrong with that. Only a moron would suggest that there is anything left wing about either Ken Clarke or David Miller. Given that 38% of the Tories thought he was the best choice for leader, I guess the Tory party is completely overrun with Swivel Eyed Trots. Maybe thats why the leaders of Barnet Council act like Stalinists so regularly, trying to silence opponents in the media? It's bad enough that you are clearly a moron, it's even worse that you are a cowardly one who won't put an ID to your stupid comments.